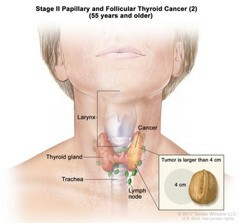 Stage II papillary and follicular thyroid cancer (2) in patients 55 years and older; drawing shows cancer in the thyroid gland and the tumor is larger than 4 centimeters. An inset shows 4 centimeters is about the size of a walnut. Also shown are the lymph nodes, larynx, and trachea. Stage II papillary and follicular thyroid cancer (2) in patients 55 years and older. Cancer is found in the thyroid and the tumor is larger than 4 centimeters. Cancer may have spread to nearby lymph nodes.